UPDATE 17/10/18: Developer Digital Sun has revealed that Moonlighter, its delightful shopkeeping and dungeon-crawling action-RPG, will be heading to Switch on November 5th – in both digital and physical forms. 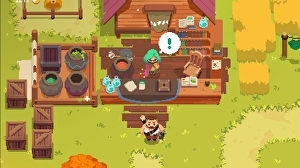 Those content with their intangible ones and zeroes will be able to download Moonlighter from Nintendo’s eShop for the sum of £22.49/$24.99 USD. Fans of physical releases, however, have a number of different options. If you’re really keen to push the boat out, for instance, you can opt for Moonlighter’s thing-packed, limited-run £45 Signature Edition. This hefty box includes a region free copy of the game, an original soundtrack CD, an A3 poster, a “squishy jelly-monster figure” and a Moonlighter medallion. Alternatively, there’s a £30 standard edition which includes the game and none of the extra gubbins.